Today is the Spring Equinox, which marks the official beginning of Spring! Today the day and night are of equal length, and the days will begin to get a little longer each day. 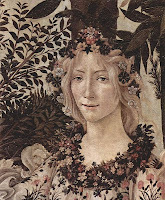 In celebration I'll share this lovely painting called Primavera (Beginning of Spring) by the Italian Renaissance painter Botticelli. 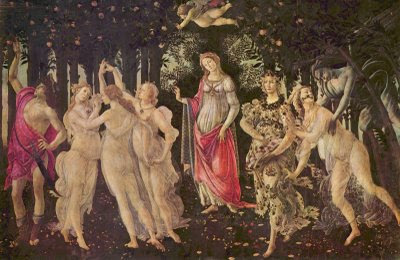 Venus stands in the center, clothed as an elegant lady of Florence, with her son Cupid above. On the right you can see Zephyr, god of the west wind, blowing in warm breezes as he chases the nymph Chloris, bringer of new growth, whose name means "yellow-green" or "fresh." Then there is my favorite, Flora adorned in flowers and scattering blossoms of forget-me-not, hyacinth, iris, periwinkle, anemone, and wild roses, all flowers that would have bloomed in Tuscany in May. There is a beautiful image I heard once in some myth or tale, describing how at the arrival of spring Flora spreads her beautiful floral dress out across the earth, covering the ground with flowers and new grass. On the far left the three Graces dance while Mercury watches the sky to keep away storms. Do your own little dance today to celebrate the arrival of Spring and the promise of growth and renewal and creativity!